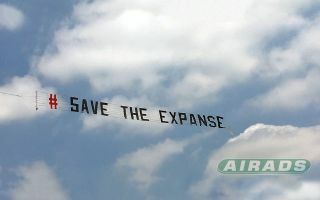 Fans of the space epic "The Expanse" hired a banner to be flown over Amazon Studios in Santa Monica May 16, 2018, to encourage the company to pick up rights to the show. After the show's cancellation on the Syfy channel last week, fans of the solar-system-spanning adventure "The Expanse" have rallied, encouraging Amazon and Netflix to pick up the show and garnering support from cast members and celebrities. The show is fully produced and financed by Alcon Television Group, with Syfy given first-run airing rights in the U.S. American viewers can stream the series on Amazon Prime, whereas Netflix has the show's international rights, according to Deadline.com. Cas Anvar, who plays the pilot of the ship Rocinante on the show, talked live to fans over two Twitter videos yesterday (a full version is on Facebook, too). "It was kind of hard for all of us to understand exactly what had happened with a show that was getting 100 percent on Rotten Tomatoes, and the reviews that were euphoric, in my opinion, from both the press and from you guys," he said in the first video. He explained that while streaming views were excellent, the show hadn't had great statistics for live views. "The response from Syfy and Alcon was not the end of the world. They literally said that if all the planets align, and if this, that and the other thing happen, something might change — the equation might shift." "The one thing that I got from Syfy network is that if there is a monumental, dramatic shift in the ratings live on our show, if people start watching the show, if you get new people to watch this show, there may be another conversation that happens," he added. Actor Patton Oswalt and author George R.R. Martin, a long-time supporter of the book series, also posted their support on Twitter. The love fans are showing "The Expanse" has not been lost on the show's makers. "The outpouring of support and enthusiasm from the fans of 'The Expanse' has been remarkable and encouraging," Alcon Entertainment co-CEOs Andrew Kosove and Broderick Johnson said in a statement. "The show’' impassioned fan base, including hundreds of thousands of viewers and the likes of of George R.R. Martin and Patton Oswalt, appear to be as hopeful as we are that this stunning space drama can find a new home on another platform." Showrunner Naren Shankar — who Space.com talked with about the making of Season 3 — posted on the official site for book series author James S.A. Corey (actually co-authors Daniel Abraham and Ty Franck), offering hope to fans. "Alcon TV Studios is doing everything they can to find continued life for the series," Shankar said. "In the meantime, keep watching and (hopefully) raving — and making noise. Let people know what they've been missing. We are only halfway through the season and there is SO MUCH MORE to come. You will not want to miss it." And that's something Earthers, Martians and Belters can all agree on. The newest episode of "The Expanse" Season 3 airs tonight (May 16) at 9 p.m. EDT/PDT (8 p.m. CDT) on Syfy. You can follow the evolving campaign to save "The Expanse" on Reddit and on Twitter. Editor's note: This story was updated May 17 to include comments from Alcon Entertainment.